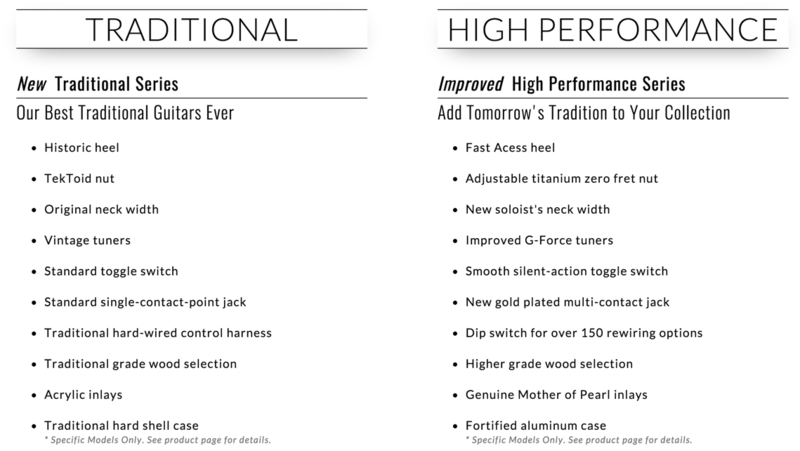 2016 Gibson Line - High Performance vs... Low Performance? Almost two years ago, we talked about how Gibson was going pretty high tech with their new models. I’m not sure if people rejected this change (probably), it made the lineup too confusing (probably) or it made it too difficult to keep making the same guitar they’ve made for 70 years at crazy high margins (bingo! ), but regardless they are changing it up. For 2016, there will be a clear line in the sand on what kind of Gibson owner you are. Let me introduce the 2016 Gibson Models. Across the board, the High Performance models cost about 30-40% more than their Traditional counterparts. For that money, you get a mix of features that Gibson should have included 30 years ago and some aesthetic features that you may not care about. Think about it this way… a “Fast Access” heel costs virtually nothing more than the traditional version. If the entire lineup switched to one heel, it no longer requires any special machine setup or a separate production line or anything. Same for the neck width change (of course, that may not be an improvement, but let’s pretend). A better nut with zero fret does cost money and take additional work. But again, if every model has it you can minimize those costs. A better switch and jack cost pennies when looking at a $1-2k guitar. Where is the actual cost? Definitely in wood upgrades. Better inlays and a nicer case surely add something to the price without really adding anything to the guitar. The G-Force tuners is another larger ticket item, and I’m sure players will have very different opinions on their value. So that’s all kind of a bummer for a lot of players. The features that you will really notice every time you play the guitar only come on the model that has a big price hike due to the things that only matter when you’re looking at the guitar. The one redeeming aspect, the prices aren’t terrible across the board. That there are numerous “HP” models under $1500 in a time when folks like Suhr will charge that price for a Chinese model and that’s okay. I still wish Gibson, Fender or any of the other bigger players would dip their toes in with the mass-customization route (think of buying a computer online where you pick monitor size, memory, HD space, etc). Like, maybe I want to splurge on the LP Standard HP, but am cool saving a few bucks and taking the normal tuners and a basic case. That’s not going to reconfigure their entire building process and I get the exact guitar I want or very close to it. Do it Gibson.